Named after Charles Henry Darling, the Lieutenant Governor of the Cape in 1851, Darling is a mere 45 minute drive from Cape Town. 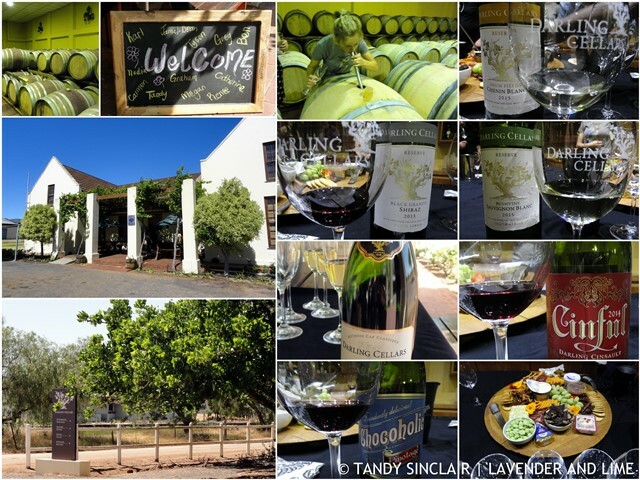 Darling is now considered a top wine region and our day in Darling starts with a visit to Darling Cellars. Here we are warmly welcomed with a glass of the 2013 Blanc de Blanc Brut MCC. I can taste the guava on my palate, but put my glass down without finishing it so that I can pay attention to Maggie. Maggie is the white wine maker at the co-operative and our guide for the morning. The cellars were established in 1950 and bottling started on site in 1997, with the bottling plant running nearly every day of the year. This dry land area has 18 farms contributing grapes to Darling Cellars and the yield is a whopping 5.6 million bottles per year. Everything is done on site, and it is abundantly clear why so much space is needed for this venture. Whole berries are delivered to the cellar area and 3 presses are used, which allow for the processing of 200 – 300 tonnes of grapes per day. If the delivery from the farms exceeds this, then the berries are stored whole in a controlled climate environment. Gravity is used to move the juice around the cellar, which is a time consuming task. Even though there are open fermentation tanks, these are not used and have fallen into disrepair. The repair process is slow and costly, but being done to expand the fermentation options. At present, fermentation is done in tanks and a cooling system is used for the mash. Due to the volume, there is an automatic pump over in the tanks. The red wine tanks average at 40 000 litres per tank but the big mama can store 300 000 litres! There is a separate white wine store where tanks range in size from 5 000 litres to 50 000 litres. Just off this store there is a room housing a special machine for pH analysis and adjustment. A centrifuge is used for filtration before the wine moves through a cross flow filter and gyro cages are used for the second fermentation of the MCC. Even the riddling is done by machine. We have a barrel tasting of the 2015 Cinsault before heading to the tasting room where we sample 5 wines and snack on some amazing local produce. Booking essential for wine tours. Known best for it’s dairy industry, our next stop is the Darling Museum which was started to document the history of butter making in the town. There are various ‘rooms’ built into the main area, showcasing various aspects of life in the town including the clothes that were worn at the turn of the last century. Many items have been donated, and to keep children engaged, there is a touch and turn section. The museum is very well laid out, with lots of information and highlights the local equivalent of Mrs. Beeton, Hilda Duckitt. An entire room is dedicated to the various butter making machinery and it is here that we are treated to morning tea. 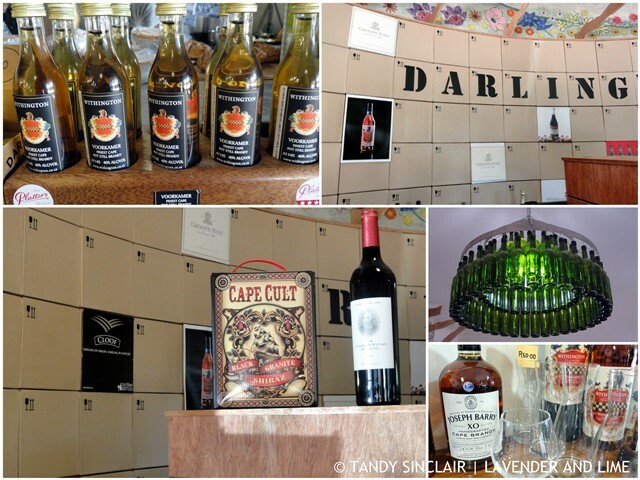 Our trip to Darling started at 9am and by the time we got to the museum I was feeling parched. While everyone else enjoyed tea or coffee, I had the only bottle of water on offer and ate a few of the sandwiches to taste more of the local produce. 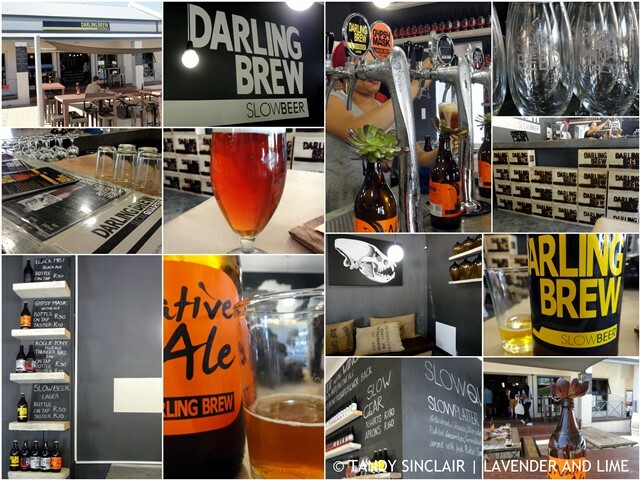 We then proceed to Darling Brew, which at the time of our visit was not yet quite finished. The official opening date was the 1st of December. Phillipa and Kevin are the owners and innovators behind this brand and we are shown around by Phillipa on the day of their first run of the bottling plant. The idea for Darling Brew was inspired in 2007 by a visit to a brewery in New Bethesda. 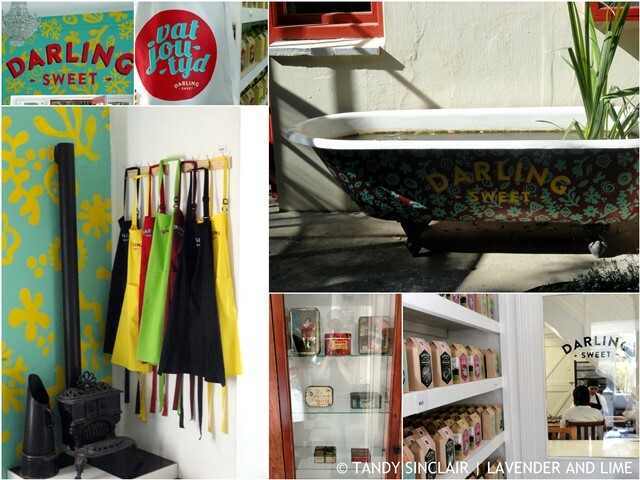 Darling Brew was made under contract by Boston Breweries and after the brand was established in the market, the building of their own micro brewery could begin. From one employee in 2011, Darling Brew employed 40 people at the time they bottled their first batch on their own site. The micro brewery is capable of producing 250 000 litres per month. We get to peek into the grain room where grain from SAB and Belgium is mixed. The grain has to be nearly sprouted for use, and this process is not yet available in South Africa, hence the need for imported grain. The brewing process is highly involved and what stands out for me is the computer controlled systems. The initial brewing process takes 7 hours and the temperature is very important to the end result. So is the addition of hops. Add them early and you get a bitter, add them at the end and you get aroma. Time and gravity are used to filter the beer and once filtered yeast is added, the beer then goes into fermentation tanks ranging from 3 000 litres to 18 000 litres for conditioning for 4 weeks. This too is temperature sensitive. Darling Brew can brew 3 000 litres at a time and the beer is tested and tasted at each stage before it is bottled or placed into kegs. A small laboratory has been built into the brewery so that Felix (the brewer) can test the beer. To mark the opening of their own brewery, new 500ml bottles have been custom made together with branded crown caps. The bottles are labelled and then cleaned before being filled with beer and capped. A light level is used for volume control and the bottling plant can handle up to 4 000 bottles per hour. This process cannot be stopped once started! 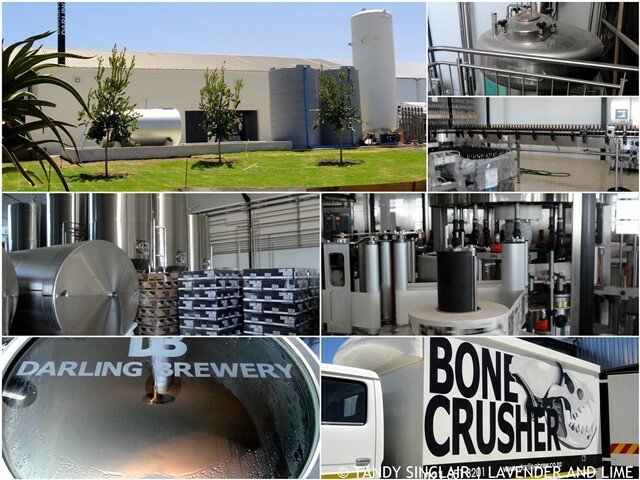 The aim for Darling Brew is to be considered a world class brewery and they would like to create their own recycling plant. Not only that, but they would like to be a major employer of the local people. A child friendly restaurant is open on site. We head back to the rural town centre to enjoy some of the Darling Beers that are available on tap at their eatery. I choose the Thunderbird IPA to have with the snack platter that is on the table for us to share. Phillippa engages us in a beer tasting, letting us know that the Slow Beer is considered their flagship. They make an easy drinking range of ales, beers, lagers and bitters to enjoy on all occasions. Look out for their small batch festive season weiss beers. These Belgium styled beers are ‘live’ and unfiltered and fermentation continues in the bottle. We walk next door to the Darling Wine Shop which is owned by Charles Withington. I met Charles in 2012 and I have still not taken him up on his offer of a meal of fresh mussels on a Friday. Charles represents most of the local wine farms and he engages us with his wit and charm in a blind tasting. Our first glass is a Withington 2013 Chardonnay followed by a Groote Post Riesling. We then taste a Smaak 2013 blend as well as Charles’ Roan Ranger which I get to take home with me. This is a Rhône style blend of Cinsault, Grenache and Mouvèdre. Charles has recently bottled some Brandy, named Voorkamer (front room) which is fruity and floral. He shows us how to sniff the Brandy through the glass, slowly bringing the lip down towards the tip of our nose to get the full Christmas cake scents. Not allowing for enough time to do all that Darling has to offer, our media group is offered the choice of going to Darling Sweets or Evita’s se Perron. Pieter Dirk Uys is a well known South African satirist and this is the home of his alter ego, Evita Bezuidenhout. The old Darling Station has been transformed into a theatre, gallery and restaurant. 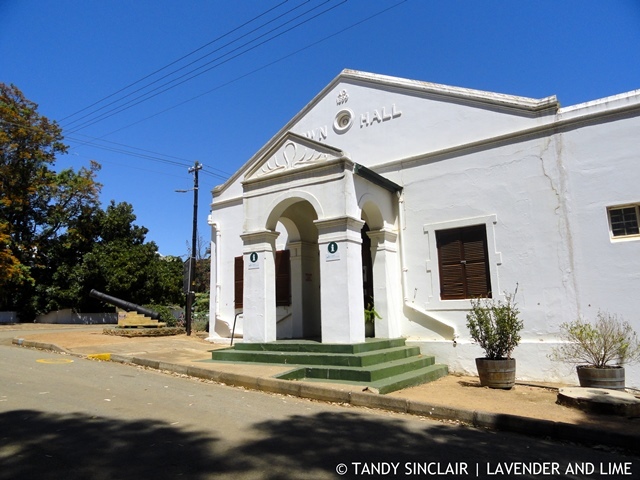 When I went to Darling with my mom to cook with Debbie who owns Trinity Lodge we visited this cultural complex. So, I chose, along with a few others to go to Darling Sweets. We start off at The Flying Pig Deli, being treated to coffees of our choice. I have a single espresso and others opt for the Viennese iced coffee that is made with condensed milk. Just as Gil starts telling us about himself, the rest of the group arrives back. Evita closes shop at 16h00 and the lights were already off when they got there. Gil starts over telling us how he makes his own charcuterie from free roaming acorn fed pigs. He also uses Nguni cattle grown by Michael Duckitt on Weylands Farm. The air cured products include Black Forest Ham and smoked bacon. 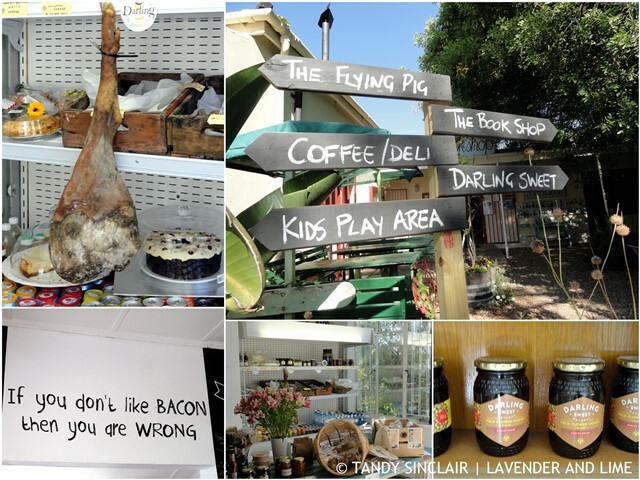 The deli sells his products, as well as showcasing local Darling produce including Udderly Delicious cheeses and Darling Gourmet Mushrooms. Darling is also known for its pomegranates and olives. With coffees drunk we are introduced to Darling Sweets owner Hentie. Together with his partner Fritz and Fritz’s mother Annette, the company was started in July. Hentie is a chef and chose to make the these old fashioned toffees here due to Darling’s historical link to butter. They are hand crafted, contain no preservatives and are made on-site. Even the reductions used to flavour the sweets are done in their kitchen, using the best equipment available. There are 6 flavours available and we get to taste as many of the flavours as we would like. I love the licourice one but am disappointed that the flavouring is sourced from Iran and the colourant from Germany. I think a small enterprise (they employ 10 people) could make better use of local ingredients, like they do for the orange and pomegranate toffee. 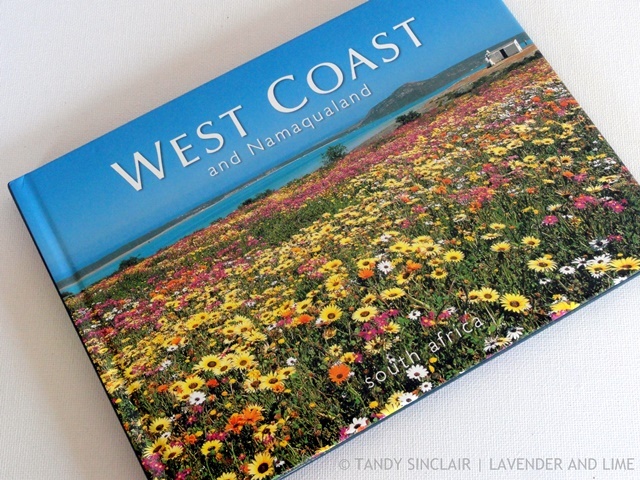 We quickly pop in to the Book League, the local book store and here we are gifted a copy of West Coast and Namaqualand. As my mother in law is crazy about local flowers I will take my copy to her when next we visit. We pile back into the bus, head to Eden On The Bay to collect our cars and I get home at supper time after an amazing visit to Darling. Disclosure: I was invited to spend the day in darling by Catherine Pate and Carmen Lerm of West Coast Way. I was not asked to blog about the event. This post is in line with my blogging policy. If you are going to visit Darling to see all we did, I would recommend that you stay overnight. I can highly recommend Trinity Lodge where you will find pure comfort and excellent food. I am on leave until the 11th of January. I will reply to comments on my posts when I can during the holidays. For those of you celebrating, may your Christmas holiday be a meaningful celebration. What an awesome trip! Looks like you got to take advantage of so much Darling has to offer.